FallCon is ramping up and we’re getting ready for another fantastic show on October 4th at the Education Building on the Fairgrounds. We’re picking up the threads from the untimely and tragic passing of our Chief Bottle Washer and One-Man Band, Nick Post, and doing the best we can to carry the torch of the MCBA now and into the future. Just in case you didn’t see our latest posting on Facebook and our website, a lot of artists and creators have been asking what they can do to honor Nick’s life and continue his spirit. Part of what made Nick so great was his selflessness in giving. Giving people the chance, the encouragement, and the opportunity to succeed. We normally don’t do auctions at FallCon but…for this year only, we will be holding the Nick Post Memorial Silent Auction. Just as with our SpringCon Charity Art Auction, artists and creators can donate sketches, pages, etc. We will take bids on these items throughout the FallCon show. At the end of the show, the winning bidders can pay for their items by check, cash, or credit card. 100% of the money will be donated to the Minneapolis College of Arts & Design to be used as a scholarship for their Comic Art program. Your generosity will put as many talented and promising artists, that otherwise wouldn’t be able to afford it, through MCAD’s Comic Art program as the money will allow. Artists/creators can bring their donations with them to FallCon, drop them off at The Source, or you can send them to me directly. Email us through Facebook or at MCBAguest@gmail.com and we’ll give you an address to send your donations. Some artists have even asked who they should draw, in honor of Nick. That’s a tough one to answer. Nick’s favorite character was Superman. But he also loved characters like Black Bolt, The Creeper, the 3 witches from The Witching Hour, and The Badger (yes, Nick thought The Badger “was awesome!”). But, in the end, you are the artist and who or what you draw to donate is entirely up to you. Just as with the regular charity auction, we’ll gladly take any family friendly artwork and, as always, THANK YOU for your kind and generous donation. Thanks everyone! Get ready for a GREAT SHOW! There was no bigger supporter of the Minneapolis cartooning community than Nick. If you’ve ever had a free table at Fallcon or Springcon, you can thank Nick. If you’ve ever had the Source buy ten of your comics sight unseen, you can thank Nick. Many of the Cartoonist Conspiracy’s projects would not have been possible without his support… for one example, the Midwest Comic Book Association and The Source funded the vast majority of the BIG FUNNY project under Nick’s influence. Nick was incredibly generous and incredibly genuine. He was a retailer, but he never stopped being a comic fan. Boy, will he ever be missed. 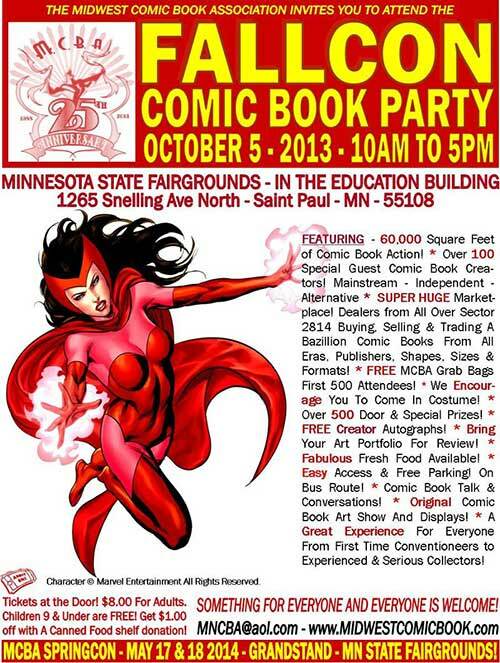 Below is a press release from our good friends at the Midwest Comic Book Association (MCBA). The Wizard corporate behemoth has decided to directly complete against the beloved local, non-profit, volunteer-run Springcon convention. Wizard is truly the Wal-Mart of comics conventions. Springcon and its sister convention Fallcon (both run by the MCBA) both offer free table space to professional and amateur creators… if there are any other conventions that do this, I’ve never heard of them. Their generosity and inclusiveness is pretty unbelievable. The MCBA does much to support the local comics and cartoonist community beyond the conventions as well… we are very lucky to have them around. I encourage you all to strongly consider whether you want to support Wizard’s ugly corporate convention, designed to funnel money and energy out of our community. With your help, perhaps we can make them reconsider whether they really want their tentacles in the Twin Cities venue. I will not be attending any Wizard conventions, ever, either as a guest or a consumer… which is an easy decision for me to make. Since I have no investment in making or reading mainstream comics, I have little to lose. Some of you may think you do have something to lose, which may make this decision more difficult for you. Keep in mind, though, if no one attends, you probably have a lot more to lose by attending it. Twin Cities, Minneapolis, Saint Paul, MN (August 12, 2013) – The New York based Wizard World convention organization has once again decided to reach out and attempt to bully a long standing regional convention group. 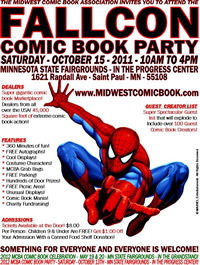 This time it’s the Twin Cities based (Minneapolis/Saint Paul, MN) all volunteer, not for profit Midwest Comic Book Association that is Wizards target. Oddly enough the MCBA, an all volunteer, not for profit group was initially excited to hear the rumors that Wizard was coming to town. For 25 years they’ve been dedicated to providing promotions, service and support to the comic book industry and the creators/retailers who make their living in it. They viewed Wizards arrival and high industry profile as an opportunity to grow the community and looked forward to working with them in a support capacity as well. The more the merrier. Unbeknownst to the MCBA, Wizard evidently has other plans. Every year for the past 25 years the MCBA has sponsored two public events. One is the SpringCon show, a two day show traditionally held in May and a one day show called FallCon in October. So out of all of the dates available to Wizard, they choose to schedule their premier event in the Twin Cities on May 3 & 4, 2014. Just two weeks ahead of the weekend SpringCon which is held May 17 & 18, 2014). Seems like the “new Wizard” is just like the old Wizard. Recently, Nick Postiglione, one of the lead MCBA volunteers recently spoke with Peter Katz, Senior VP of Business Affairs& Development for Wizard who informed him “we had no idea that we were scheduling so close to the MCBAs event” and further continued that the proposed space (the Minneapolis Convention Center) “Only had the first weekend in May available to us”. The MCBA SpringCon dates for 2014 have been posted for quite some time on numerous industry websites and the MCBA website as well. In addition, one quick phone call inquiry to a space rental employee about space availability at the Minneapolis Convention Center put the lie to his availability statement. Evidently, the first week in May was specifically and strategically chosen. There you have it. A group that has donated over 30 tons of food to the food shelves, over $100,000.00 to the Comic Book Legal Defense Fund, the MN Lupus Foundation and the MN Literacy council, as well as promoting retailer and creator events and other regional events is about to be bullied about by the corporate Wizard World convention machine. Again, seems like the “new Wizard” is just like the old Wizard. Most people in the comic book world are acutely aware of Wizards history of predatory convention and comic book industry practices. Wizards will claim it is not so and that the “new Wizard” is a “much different organization” than that of years past. This is simply not true. This situation perpetrated by Wizard is a willful and purposeful attempt to corner a market and squash the local competition regardless of the negative effects it would have on the regional community and highlights, once again, Wizards self serving, predatory instincts. To be sure, we live and work in a free market system based on competitive principles. Competition generally serves us well. But, given the unique nature of the comic book industry, the situation is definitely unique and traditionally acts as such. It’s a multi layered community composed of many different, and ever evolving, wildly diverse creative and financial elements. Minneapolis St. Paul is the 15th largest media market in the United States and should easily be able to handle two events of this type. However, that’s not in question here. What is in question is Wizards ethics. While this issue may or may not be concerned with your specific geographical area or affect the way your participate in the world of comic books right now, make no mistake, it is your community here that is under assault and this is your call to action! Vote with your dollars and your heart when choosing what events to support and attend. Please e-mail or call Peter Katz at Wizard and let him know where you stand regarding this type of predatory market behavior. Your community needs you to be heard! Based on what the MCBA has stated in public, if Wizard did the right thing regarding their event dates, they would welcome them with open supportive arms and continue to help build a bigger, better, healthier comic book community for all of us. Special thanks to the peacemakers at the MCBA who provided the information used in this press release. 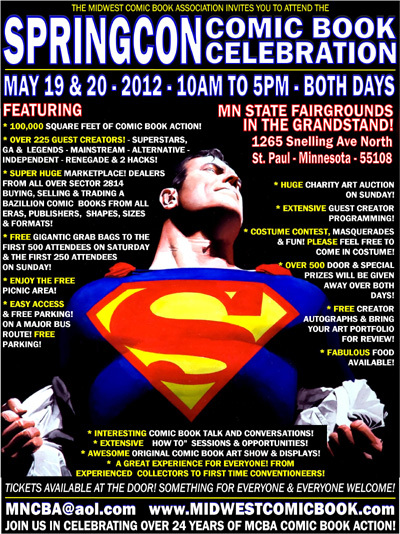 Springcon, the biggest comic book convention in Minnesota is this weekend! Our incredibly generous friends at the Midwest Comic Book Association have given free table space to over 250 cartoonists this year! It is always a fantastically fun and friendly time… I hope to see you there! 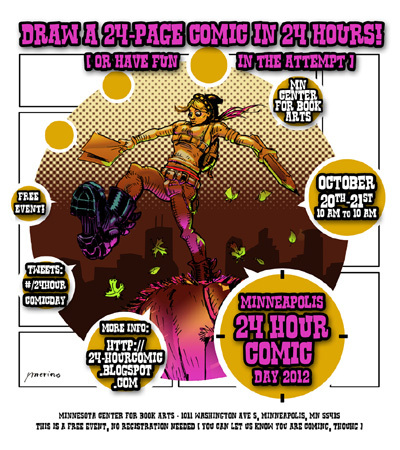 Above: 24 Hour Comics Day Minneapolis 2012 Poster by Carlos Merino… click on it for a larger version… click here for a version you can download, print and distribute. 24 hours. Draw 24 pages of comics— or have fun in the attempt. Nutshell: Take no more than 24 hours to draw 24 pages of comics. It’s a dare and a creative exercise. It won’t be your best comic, but it will be among your longest comics. You are not supposed to think of an idea beforehand. You can prepare your materials beforehand. You can line boxes onto your paper and such. Wet Paint of St. Paul will have a store there for the first few hours, so you can fill in materials you forgot to bring. Consider working smaller than you usually do. 24 pages is a lot of ground to cover in 24 hours. 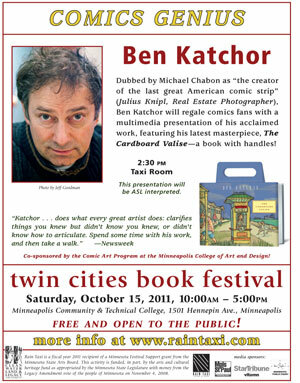 Minneapolis version is at MCBA and starts at 10 a.m. Saturday morning. Come a little early to get there before the starting bell. Spending 24 hours in one place can be difficult. Bring snacks, beverages, personal entertainment/distraction devices, a cushion for sitting, a toothbrush. Bring snacks for others, if you wish. There’ll be a table or two to hold community snack items. MCBA has a wifi network. It’s better than nothing, but there are ever-more computers showing up at the event, and that seems to slow down the wifi. There are not many outlets. If you are bringing lots of electronic companions, consider bringing a power strip. Many people finish by the 17-hour mark (2 or 3 in the morning) and go home. That’s okay. Many people quit before finishing. That’s okay, too. We’re all in the room together, but except for pizza time, it’s not really a chit-chatty, loud-music social event. Words of encouragement, however are always welcome. Thanks much to the Minnesota Center for Book Arts for providing us with the best imaginable space for this event to take place in! Thanks much to the Midwest Comic Book Association for providing us with free late night pizza! Thanks much to Wet Paint Art for providing some free supplies for folks to use (note: you will still want to bring your own supplies)! Springcon is this weekend! The friendly folks at the Midwest Comic Book Association put on a heck of a fun show, do yourself a favor and check it out. This year they have over 225 guest creators… all of which are generously given free table space to join the fun. Fallcon and Book Fest this Weekend! Too much fun in Minneapolis this weekend!